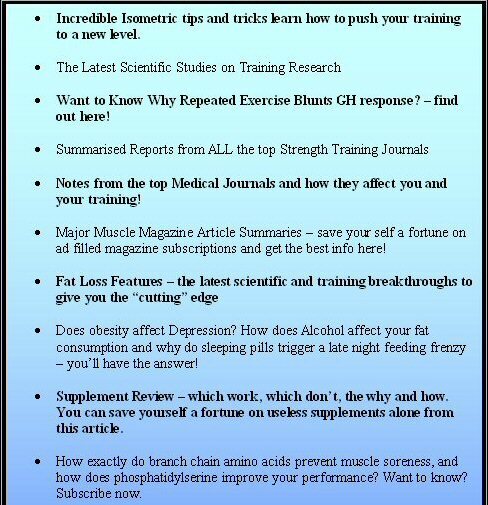 The 7 Seconds to Strength Ezine is the Newsletter for the Worlds Largest Online Resource on Isometrics – This Ezine contains the most efficient and effective method for developing lean muscle tissue, functional strength and long term weight loss. If I haven’t made it clear by now – you’d be crazy not to subscribe. 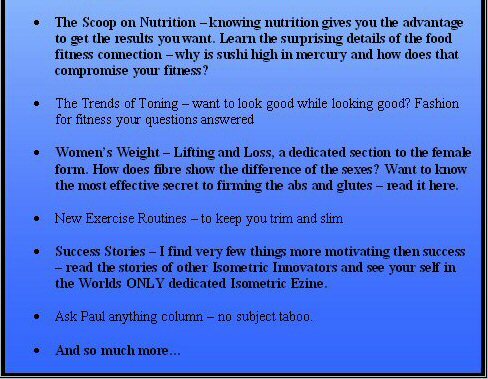 This Ezine, 7-Seconds to Strength, named so because it only takes 7 Seconds to stimulate new muscles growth, provides the latest information in the world of fitness, muscle development, strength training and weight loss. You will be the 1st to hear the cutting edge news and real life success stories of Isometric Innovators and get all the tips, techniques and advice on transforming your body, your mind and your life. Here are some of the things you can look forward to in each issue of 7 Seconds to Strength. On top of all that – for a limited time only you can get a FREE copy to Body Ball Blast – Rolling Your Way to Health. This incredible e-book details how you can use a Stability Ball and Isometrics to get in awesome shape. You can read more about it here. Well there’s nothing more to say – except SIGN UP NOW!